“His memory was always so sharp, it must be his age.” “It’s just little things she’s forgetting.” “It’s the stress.” These comments I hear from friends, potential clients or their family members may all be true, but they ignore the bigger picture. Watching a loved one’s memory change is difficult and stressful. We try to explain it away. It’s just little things or stress causing the forgetfulness. Yes, stress and aging can cause memory changes. But small memory lapses can lead to or mask larger issues. Let’s not ignore the elephant in the room. Let’s take control of small memory issues before they grow larger. Stress plays a key role in some memory changes that occur with aging. The aging brain takes longer to process and learn new things. Stress can also lead to less memory formation. Changes we take in stride in our 30’s to 50’s take longer to adapt to in our 60’s to 80’s. But it can be done. When repeated forgetfulness or inability to cope with stress or change occurs, there may be an underlying issue. So what can be done? Exercising different areas of the brain in an enjoyable way can keep those brain cells connecting and functioning well. An older brain thinks differently and at times a bit slower. While some of the new games and computer programs available are a wonderful resource, those who take longer to process may get frustrated. Feeling this need, MemoryMinders Academy was created. This subscription service provides mental fitness to be done at an individual’s own pace. Each week, two original MemoryMinders mental fitness activities are emailed with along with invaluable memory wellness tips and strategies. Subscribers then print off the activities to complete at their own pace. Two different levels are available to provide stimulation without stress. 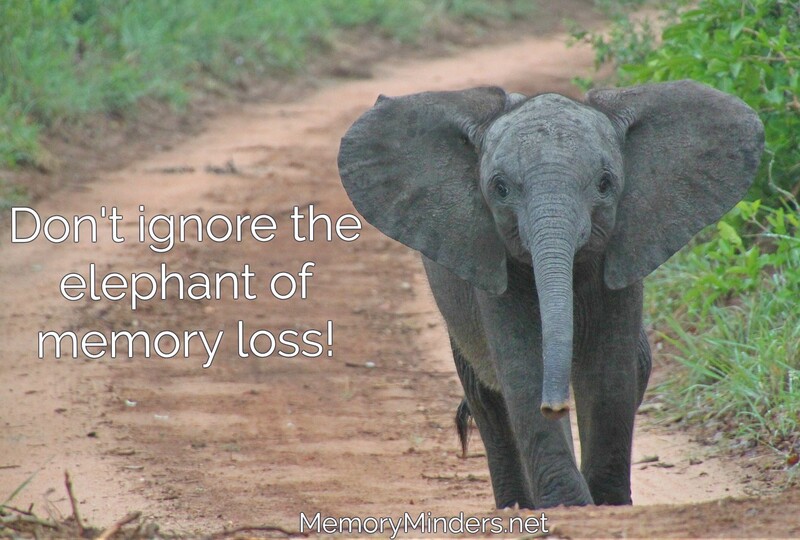 For more information on MemoryMinders Academy, click here or contact us. Address memory changes you see in yourself or others. Speak with your doctor and engage in activities to assist memory, possibly including MemoryMinders services like the Academy subscription. Don’t ignore the elephant, do something about it! Jill, This is an excellent write up. As you know I have subscribed on behalf of my mother. She has been pretty consistent with keeping up with the exercises. I commend you on your program, it is extremely well done. My only concern is if my (90 yr. young) mother was left to navigate the Memory Minder emails, I know she would have some difficulty. Thanks Jean and yes, I do understand the somewhat complex nature of the emails and am trying to make them as user friendly as possible. I believe having engaged loved ones like yourself is of great benefit to those in need of Academy services. Thanks for your encouragment and support of MemoryMinders Academy!